As someone who, like most of his generation, grew up watching and enjoying the Harry Potter movies, I still couldn’t muster up enough excitement for the new spin-off, Fantastic Beasts and Where To Find Them. Now don’t get me wrong, I did think that the franchise kick-starter, written for the screen by J.K. Rowling herself, looked fun enough for anyone to go along and watch, but there was still something about it that just never fully appealed to me, no matter how hard I tried to convince myself otherwise. After now seeing the film, I think I can pin down the reason why: I’m just not a fan of director David Yates’ style. Yates, who returns to the Potter universe after directing numbers 5-8 of the original series, has always had a style of direction that I’ve never been able to get behind. I have previously found his staging, pacing and framing, among other things, to be really awkward and rather lifeless, particularly in the last three Potter movies that he did, and that awkwardness has always prevented me from fully enjoying the films he has made, even the non-Potter ones like last summer’s The Legend of Tarzan. There’s just something about it that constantly feels off to me, and I cannot pin down what it is specifically aside from the ones I previously mentioned, but his particular style has always rubbed me the wrong way, no matter how many times other people have called me crazy for thinking that about him. His position as director for Fantastic Beasts, and his subsequent hiring to make the planned four films after this one, has always filled me with doubt as well as the fear that I would have to endure his awkwardness for at least a whole trilogy’s worth of more films, and sure enough I found it to be the same with this film. In fairness, Yates does know how to bring alive certain aspects of a story to the big screen, but just like in his contributions to the Harry Potter series a lot of the scenes here are just framed, paced etc so awkwardly that it can be distracting – which is a shame, because once I can get past that, it’s really not that bad of a film. Taking place in 1920s New York, the film follows British wizard Newt Scamander (Eddie Redmayne) stopping off in the Big Apple and coming across several parts of the American wizarding community, from its own version of the Ministry of Magic (dubbed MACUSA) to what American witches and wizards perceive as Muggles, or “No-Majs”. 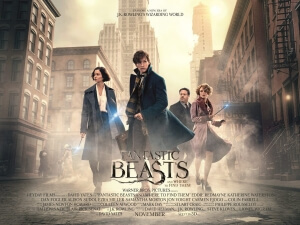 One particular “No-Maj”, a factory worker named Jacob (Dan Fogler), accidentally switches his briefcase for Newt’s, which happens to inhabit several mystical creatures inside its TARDIS-like interior, and upon opening it he unleashes several of those creatures into the city, and now it’s up to Newt, Jacob, disgraced Auror Tina (Katherine Waterston) and her sister Queenie (Alison Sudol) to recapture them before they do some serious damage in a city that’s already in a tense situation. That’s because there’s not only huge pressure on MACUSA to preserve their magical presence from No-Majs, but a sinister cult leader (Samantha Morton) is raging against witches and wizards, even demanding a “second Salem” to purge them from the human world, which attracts a sinister Auror named Percival Graves (Colin Farrell) to their cause for reasons unknown. Rowling’s imagination, the same kind that catapulted her into the public eye with her initial Potter books, is on full display here, and in her writing she makes it clear how fascinated she wants the audience to be with how magic is perceived in America, as opposed to the British settings of Hogwarts et al that we’re so used to already. In many regards, she wins us over with how intricate and layered out it seems, something that the 1920s pre-Depression setting really adds to with its delightfully retro feel and interesting context. At the same time, she gives us enough of this part of the world to leave us satisfied, while also leaving us hungry for just a little bit more; if the sequels follow through with plans to visit other parts of the world like Paris, then we could be facing a spin-off franchise that has a genuine and refreshing international flavour to it, something which hopefully Rowling can keep consistent. The cast, too, are having fun, with Redmayne and Waterston being adorably quirky in their own way, but it is Fogler who ends up having not only the best character in the film but also being one of the best parts of the film, period. His Jacob is clearly an audience surrogate, but he is given enough material to register as his own character, one that you end up liking quite a bit and even sympathising at certain points, more so than a number of the other characters. Like the film, however, he is a fine one-off that stands surprisingly well on his own without the crutches of fan-service to keep him straight (there are only fleeting references to Hogwarts, Albus Dumbledore and other familiar namedrops here). Fantastic Beasts and Where To Find Them is a decent standalone story in J.K. Rowling’s wizarding world, one that benefits from an imaginative screenplay by Rowling herself, but from a personal standpoint it is impossible to get over David Yates’ awkward and often lifeless direction, which can often be distracting enough to fully enjoy.